Although the beginnings of the creative arts in Slovakia, including sculpture, are generally dated back to the 19th century in connection with the process of national revival, the oldest artefacts of sculpture in the territory of present-day Slovakia were created in prehistoric times. For example, the unusually-shaped Moravian Venus, a small realistic sculpture of a naked female figure found in Moravany nad Váhom, near Piešťany, was made from a mammoth’s tusk during the Late Stone Age, about 22500 BCE. Other artefacts have also been found in Slovakia, such as statues made from bones and clay, decorated with carvings or natural painting techniques. After the discovery of metals they also began to be used, offering prehistoric ‘artists’ a new potential for expression. The means of such expression in bronze have mainly been discovered through finds of Celtic coins, jewellery and weapons, as well as other utility objects with extra artistic value. The period of Roman dominance left behind rather smaller sculptures, either free-standing or relief. Unique examples of free-standing sculptures found in Slovak territory include the true-to-life torso of Silenus (teacher and companion of the wine-god Dionysus, the Roman Bacchus) from Pobedím. The era of the Great Migration in Europe and the spiritual culture of the first Slavs in Slovakia is not documented by many archaeological sites and thus by the artefacts of art culture. All that has survived takes the form of ecclesiastical objects from neighbouring areas which exercised a direct influence on the territory of Slovakia. The expansion of Christianity in Central Europe left tangible evidence in the form of many liturgical objects (from Zlaté Moravce, Trnovec, etc) with greater or lesser amounts of schematic decoration. The later Romanesque period was mainly represented by relief sculptures which reflected the dominant architecture of that time. The first Gothic churches appeared in Slovakia as late as half way through the 13th century (the Parish Church in Kaplná near Trnava), heralding a more important role for sculpture in cathedral architecture. Most artefacts from late Medieval Central Europe, which can now only be seen in museums and galleries, came about as parts of altar structures. Sculptures of this period began to depict real proportions in nature and this is reflected in the predominance of human figures. Most of the statues preserved in Slovak territory were made from wood and originated from wood-carving workshops in the Central Slovakia and Spiš regions. Later, the ‘Beauty Style’ or ‘Cult of the Beautiful Madonna’ reached the Hungarian kingdom. This style attempted to depict the Mother of God as a gentle young woman, typologically arising from the contemporary notion of a gentlewoman. A relatively tall sculpture with a typically sigmoid posture, gentle facial lines and richly flowing drapery, represented the prototype of Gothic Marian sculpture in Slovakia during this period. 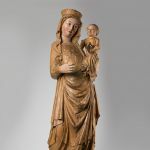 Perhaps the best example is the Madonna from Ruskinovce, made by an unknown 14th-century woodcarver from the Spiš region, which is currently owned by the Slovak National Gallery (SNG). The best-known sculptor from the Gothic era in Slovakia was Master Pavol of Levoča, whose Late Gothic masterpiece, the main altar in St James’ Church in Levoča with a scene of the Last Supper and statues of the Madonna, St John and St James, is the tallest wooden altar in the world. With the works of art from his workshop, Master Pavol culminated the more than two-hundred-year tradition of woodcarving in the region. The 16th and 17th centuries in Slovakia were closely associated with the Renaissance and the religious Reformation. After the altarpiece in Levoča, the last great medieval work of art in Slovakia, new stylistic phenomena and versions of naturalism and individualism began to occur, directed towards the humanistic rigour of the Renaissance understanding of humans. This period was also characterised by the blending of national traditions with the Renaissance and mannerism. With a few minor exceptions, the centre of art production at this time was western Slovakia. Key early-Renaissance sculptural monuments include the St George altars in the Parish Church of Svätý Jur near Bratislava and in Spišská Sobota, both by Master Pavol of Levoča. Under the influence of the Reformation, the production of altar sculpture gradually faded away and sculptural art was refocused on tomb sculpture for the aristocratic and ecclesiastical hierarchy. Sculptural tomb reliefs were characterised by three-dimensional space, perspective, plasticity and the true portrayal of figures carved with a deep knowledge of anatomy. Major works of such kind in Central Europe include the figural tomb of Archbishop Mikuláš Oláh of Esztergom at St Nicolaus’ Cathedral in Trnava, which was carved by an unknown Austrian sculptor. The relationship between sculpture and architecture was mainly developed in the form of epitaphs on walls. The Renaissance art of sculpture in Slovakia is represented by the unique Roland’s Fountain in Bratislava, made to order for Emperor Maximilian II in 1572 by the German sculptor Ondrej Luttringer. The fountain was later supplemented with a work of art that was unique at that time in Slovakia – a free-standing figure of an armoured knight. The 17th century was marked by tensions between the Hungarian aristocracy and the imperial court of the Habsburgs, and by related conflicts between the Evangelical and Catholic churches. These conflicts resulted in a process of re-Catholicisation which was also reflected in the artefacts that were preserved until the present day. 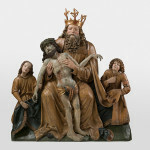 Sculptural art returned to woodcarving and the decoration of churches. The new Baroque style occurred gradually in Slovakia. Baroque architecture was highly decorative, with sculptures commissioned from famous Italian artists. The Baroque style in western Slovakia was greatly influenced by Vienna. The key works of art in the classicist Baroque style were created by Viennese sculptor Juraj Rafael Donner in St Martin’s Cathedral in Bratislava, where he decorated the St John the Almoner’s chapel and a group of monumental equestrian statues. The 10 years of Donner’s activity in Bratislava considerably encouraged the production of sculpture and stone-cutting. Another representative of that time who was, however, inclined towards the ‘sweeter’ Rococo style, was Ludwig Gode, Donner’s trainee and workmate in Bratislava. 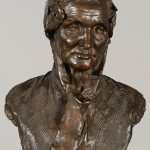 Another Austrian artist living and working in the western Slovak region was Franz Xaver Seegen, who represented the classicist trend in Central European sculpture. 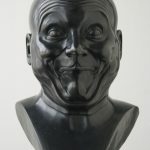 Austrian sculptor Franz Xaver Messerschmidt, who lived and worked in Bratislava in his later years and whose work closed the great era of Baroque sculpture in Slovakia, must also not be forgotten. After his death, 69 busts were found on his estate, capturing different facial expressions and grimaces. Quality casts of these busts (part of which are currently held by the Slovak National Gallery (SNG)) were made to order at the beginning of the 19th century by Franz Jacob Steger’s workshop for the Prince of Lichtenstein’s residency in Valtice. 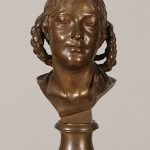 Sculpture in the 19th century was not concentrated in individual locations as such, except perhaps for Bratislava, which was favourably located in proximity to Vienna and Budapest. Sculpture started to be orientated towards portraiture, taking the form of busts, torsos or medallions (this path was initiated by a later work of art by Messerschmidt) thanks to an awaking and enlightened interest in the spiritual qualities of individuals. As a consequence of the considerable migration of artists, artistic life directly in Slovakia was quite disintegrated. Leading Hungarian sculptor István Ferenczy, a member of the generation that founded the Hungarian national school who spent some time with the famous Italian sculptor Antonio Canova, also worked in Slovakia, where he died in 1856 leaving behind several works of art, including the significant altar at the Evangelical Church in Tisovec. Bratislava citizens Viktor Tilgner and Ján Fadrusz, found self-realisation in the academic environment of Vienna and Budapest. Tilgner’s historicist materialisations are represented by the Gannymede Fountain (1888) in front of the Historic Slovak National Theatre Building and the Triton and Nymph Fountain (1877) in the courtyard of the Slovak National Gallery (SNG). Fadrusz created a monumental equestrian statue of Maria Theresia (coronation monument) which was unfortunately removed in 1919. 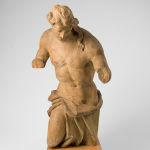 Fragments of the statue are held in several national and private collections. 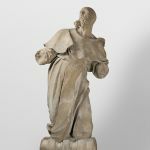 One of the most significant figures of Central European sculpture at the turn of the 19th and 20th century was Aloiz Stróbl from Liptov. He spent most of his life in Budapest, but his bond with Slovakia was considerably reflected in his work, which was mostly orientated towards portraits of prominent social figures in the Hungarian Empire as well as exterior monuments.